Chen Daoming as Lu Yanshi. 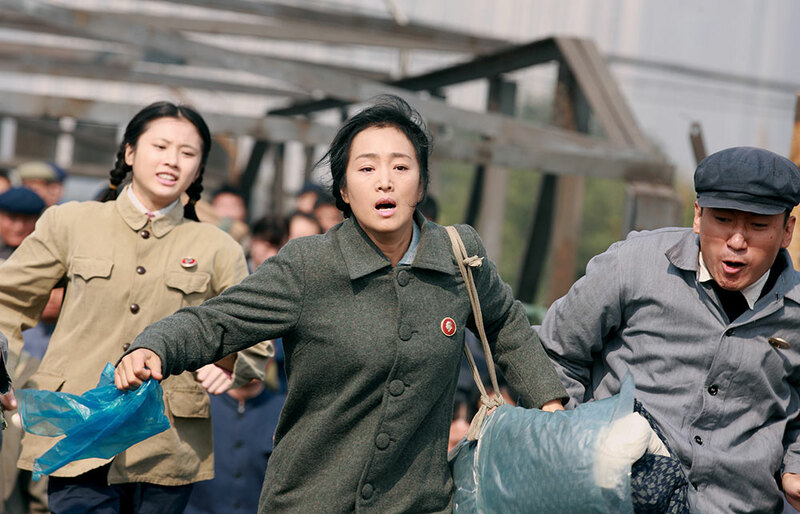 Coming Home, directed by the celebrated Zhang Yimou and released in the U.S. last week, begins as a man escapes a labor camp in China’s northwest and tries to return home. But he is captured when he and his wife attempt to meet, after their daughter turns him in in exchange for the promise of the lead role in the ballet The Red Detachment of Women. The rest of the movie takes place three years later, in 1976, after the Cultural Revolution has ended. The man, Lu Yanshi, is politically rehabilitated and allowed to return home, but his wife no longer recognizes him. The movie then follows his successive stratagems, aided by his daughter, to rouse her memory; eventually, he accepts a role that allows him to remain near to her—reading aloud his own letters to her as if he were not the one who had written them. And yet. And yet, the film seems to use history mainly to increase pathos; there is no real engagement with historical events. In China, Coming Home set a record for box office receipts for art films, grossing 295 million RMB in its first two weeks. But given the extent of official censorship, it’s a safe bet that almost no one under 35 in the audience had any prior knowledge of the events that form the backdrop to the story, or of any other traumatic events in post-1949 Chinese history. Nor, after viewing Coming Home, would such a person have learned much more. Reviews on the film’s release in the U.S. seem to reflect a similar disconnect with the past—they appreciate that history is the cause of the characters’ misery, but the film doesn’t help them understand that history any more deeply. Zhang’s sidestepping of sensitive topics seems consistent with the important commissions that he has received from the Chinese government, most notably the huge-scaled opening and closing ceremonies of the 2008 Olympics in Beijing. By contrast, in the Chinese-language press, critics in Hong Kong and Taiwan have found fault with the near-total displacement by the love story of anything resembling a historically accurate portrayal of the devastation wreaked by the Cultural Revolution. (Indeed, it is unlikely that the wife and daughter of a reactionary Rightist would live in a two-room apartment with its own kitchen and a piano and framed calligraphy.) These critics point out that the novel on which Coming Home is loosely based deals with the entire life span of its protagonist and that its author, Yan Geling, grapples with history much more fully. To this last point, Yan, who lives in the U.S. and did not write the screenplay, has replied to critics who pressed her for her views on the great deviations from her novel: “why don’t you go ask the censors.” On the whole, my sense of the movie is with Zhang’s critics—particularly given his great skill at involving our emotions. At every point on which I had some independent knowledge of historical events, I found myself protesting. At the same time, asking Zhang to make a different movie than the one he did make does not make sense. So instead, taking the lead from Yan Geling, I “asked the censors,” or rather, I searched the film for traces of a more robust reckoning with history that the censors might have passed over. These moments of implicit dissent, I believe, are deliberate. Zhang is too skillful not to have set up the resonances that give these moments meaning, but it is in the nature of hidden dissent that the creator cannot confirm that he has put hints in place. Gong Li as Feng Wanyu. The first instance is the protagonist's name, Lu Yanshi. In his given name, Yanshi, “shi” means to know or to recognize, and “yan” is an interrogative, so together they mean, "how may one know (something)?" The surname Lu could be “dalu,” “the mainland.” Zhang not only retains the name from the original novel, he shows us Lu’s wife writing his name out on a large placard, which she holds up when she goes to the station hoping to meet her husband's train, as she does every month after the end of the Cultural Revolution and the release of political prisoners. So, several times we watch her write with brush and ink in display-size characters “how may one know something in China?” Many times we see her holding this up for all to read. This includes the bleak closing scene when many years later, Lu by her side, she still awaits his arrival. This is very effective. In a sense, the entire novel is here in the repeated writing and display of the placard. One problem is that this is lost to the international audiences since to bring this out in a subtitle or even in a program note would be too overt a move. The second veiled point of dissent involves the length of Lu’s imprisonment. Lu Yanshi was exiled to a labor camp in the northwest for 20 years, not just the 10 years of the Cultural Revolution. This is stated in the movie, but it is also obscured by a plot that opens with the escape and then explains only that “three years later the Cultural Revolution ended.” Even so, Zhang provides the information clearly: the daughter is said to be three at the time of his arrest, and when the movie begins, 17 years after Lu’s imprisonment, she is old enough to be considered for lead ballerina. In other words, the protagonist must have been labeled a Rightist, as were many intellectuals, during the Anti-Rightist Movement of 1957—nine years before the Cultural Revolution started. (This is why a Party official in an early scene says of his escape, “these Rightists are cunning”). This 20 years’ hole in people’s lives was once a familiar number. To take only one famous example, the great modern poet Ai Qing, father of the activist artist Ai Weiwei, was sent to labor in the northwest in 1957, at the age of 47, and was rehabilitated in 1979. Uncounted others met the same fate. Between the 1979 mass return of exiles and Tiananmen Square demonstrations in 1989 was but a decade; the history of the 20-year hole was lived memory in 1989. But the years since then have been a period of great erasure and while it is now permissible to critically depict the Cultural Revolution, the damage caused by earlier campaigns is still off limits. In adapting the novel for his screenplay, Zhang's retention of a 20-year exile for the protagonist, even if muted by the film’s structure, is a covert signal to remember that longer stretch of history. He could have simply structured the plot of his film around the Cultural Revolution, leaving the Anti-Rightist movement out entirely. But instead he keeps it in the film quietly. The trouble with covert signals, though, is that many won’t be able to read them and there isn’t much else in the film to help. On the other hand, the films of the somewhat younger director Hu Jie, who has made unambiguous historical documentaries on the political upheavals of the 1950s and ’60s, cannot be publicly shown in China. A third subtle conveyance of political criticism is to be found in the film’s handling of The Red Detachment of Women. This is the revolutionary ballet that, at the film’s beginning, Lu’s daughter puts above her father’s freedom. During the Cultural Revolution, it was one of a handful of works permitted stage performance—which is another piece of historical context Zhang fails to provide, and that might help viewers understand the daughter’s betrayal. In the ballet, a girl joins a women’s unit of the Red Army and gradually learns to be a disciplined soldier; a man, the Party commissar who had showed her this path, dies a martyr’s death at the hands of the Guomindang. The ballet, performed in the film by Tianjin Ballet Company, is danced at three moments in the movie. The political criticism is not discernible until the third time we see it, but this final scene is made more significant by deliberate echoes from the two earlier ones. Each time, the performance is of Scene 2 of the ballet, in which the heroine Qinghua arrives at the encampment of Red soldiers, tells of the cruelties from which she has escaped, and joins the girls’ unit. The work’s best-known scene, it is a conversion scene that is, in its final appearance in the film, put to very different uses. The third time Red Detachment is danced is near the film’s end. Prompted by a recent “letter” from her husband, Feng Wanyu reconciles with her daughter and asks her to move home. In the next scene, Dandan dances for her parents: her steps are full of dramatic turns, whirls, and poses that express the character's past sufferings and current resolve. She ends with the moment in the choreography when Qinghua bows from the waist to the Party commissar. But this time the daughter bows to her father and mother. Zhang has taken a remarkable moment in Red Detachment, when the heroine bows deeply to the personification of the Party (this actually occurs twice in the ballet) and repositions the bow in the more traditional direction of the dancer’s parents. In the stage performance that closes the first part of the film, he shows us the same bow for our cross-reference. This is a touching scene of a family reunited, the mother a little infirm, seated with a quilt over her legs, Lu standing by her side, and the daughter with fully-fledged skills making her offering to the family. But Zhang is also showing us a family that has been broken by the Party, watching/dancing one of the Party’s favorite works. Feng Wanyu does not know that her daughter now works at a textile factory, and she does not recognize it is her husband by her side. There is one more disquieting moment to come from the director. When the dance ends, her mother asks, “Who is that?” When Dandan replies, “It’s Qinghua in Red Detachment!” her mother, looking vacant, responds, “Being a soldier is good too.” This non sequitur would seem to be just another symptom of her fast deteriorating stage, but she has spoken the exact same words earlier in the film. At home on the evening that the mother and daughter had been told of Lu’s escape, Dandan was doing grand battements, and she exclaims, “Will they, will they let me be Qinghua?” Her mother replies absently, “Being a soldier is good too.” (Soldiers are in the corps de ballet.) These are soothing words a mother would naturally say. What does it mean, however, when we hear these same words a second time? “Being a soldier is good too.” The first time she says it absently, her mind on the news about her husband. The second time, she says it vacantly: her mind has retained a simple thought. Perhaps the parallel of being anonymously in the corps de ballet is that the nail that sticks up is hammered down. This would apply to nearly everything in a politically vigilant state, including the film and the filmmaker. Chen Daoming, left, as Lu Yanshi and Gong Li as Feng Wanyu.